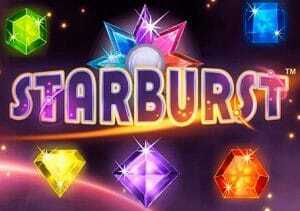 Starburst is a 5 reel 10 payline video slot powered by Net Entertainment. Playable from 10p to £100 a spin, this game is one of the most played online slots in Europe. It’s also the most popular NetEnt slot. It has a space/arcade theme with quick spinning reels and very unique in its appearance – it’s quite mesmerising. The game has a smooth soundtrack which grips you as well as beautiful diamonds and jewels that encapsulate you. That’s the only way I can explain it to be honest. Anyway, unlike most NetEnt-powered slots, there is no free spins feature. However, this game is all about the Starburst wild which can appear on the 3 middle reels. This is called the Starburst Wild feature and is triggered when a Starburst wild symbol appears on any of the 3 middle reels. When it does, the wild will expand to take over that particular reel. The other reels then respin to give you a chance of winning. If another Starburst wild appears on the other 2 middle reels, it will become sticky and give you another re-spin. You can get 3 Starburst wild reels in total with up to 3 re-spins available. This feature stops when you get no more new Starburst wild symbols. As mentioned, this game is fast paced and quite addictive. I’ve managed to win over 200 times my stake from getting 2 expanding Starburst wilds and over 450 times my stake with 3 expanding Starburst wilds. There’s a top prize of £50,000 available per spin so you need luck on your side though. This game is medium to high variance I would say with most the big wins coming in the base game I would say – you do get quite a lot of smaller wins though so you need to be patient. All I can say is that this game is different to anything you’ve ever seen and makes it unique and appealing. I didn’t quite get it initially but can see why its NetEnt’s most played slot game. I prefer more traditional slots such as Piggy Riches or Dead or Alive (and they are high variance) but if you like space/cosmic themes, you should try Star Trek by WMS Gaming which is brilliant.